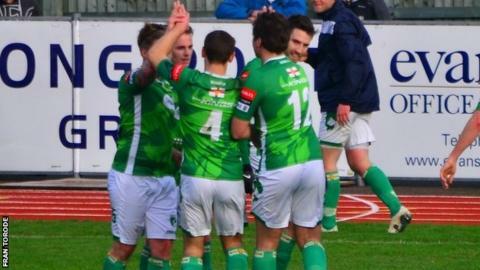 Captain Sam Cochrane says Guernsey FC's confidence is growing after their fourth win in five matches. Matt Loaring, Dave Rihoy and Ryan-Zico Black scored in their 3-0 victory over Corinthian Casuals at Footes Lane. "We're building confidence, players are coming back, training's a lot better when you've got better numbers and it shows in our results," Cochrane said. "Our aim is to get that fifth place in the play-offs and we need to continue putting a run of results together." The result lifted Guernsey to 13th in the Isthmian League Division One South table. Their run of form, as they recover from an injury crisis, follows the worst run of results in Guernsey's four-year history, winning only two of 14 league matches between mid-September and mid-December. "It's been an incredibly tough season so far for us," Cochrane told BBC Radio Guernsey. "We're limited to the squad we've got and that consists of about 26 players. "We can't go out and find extra resources like these teams in the UK and we've had a number of injuries which has affected us."